Re: How long does it usually take for the 1250-point Best Buy Mobile Reward to be credited? Thank you for reaching out to us! Please take a moment to review the previous responses to this thread if you haven't already. This bonus, just like other points, may take up to 20 days to post to your account if you qualified. If you have any other questions, please feel welcome to reach out via private message! Hello, I am writing to you in regards to the fact that I have not received my $25 rewards certificate for purchasing and activating a new cell phone. I have recently purchased two LG G5 phones and was told in store that I would receive a $25 bonus rewards certificate with each purchase. I've been tracking my account and hadn't seen the bonus points as pending, which I know is normally how it happens. I've got all my information available to send to you to look over if you need. Thank you for taking the time to help me, I appreciate the help and hope to hear back from you soon. Welcome to the forum and thank you for reaching out to us regarding our My Best Buy Mobile program! Please take a moment to review my previous responses to this thread, if you haven't already. Please know that it may take up to 20 days for these reward certificates to post. Additionally, if both of your phones were properly enrolled, you would only receive 1 certificate at this time. The offer works by enrolling a device, and then receiving the reward for the previously enrolled device upon your next device purchase. You would only receive the reward for your second device upon purchasing a third, if of course the second was properly enrolled. I apologize for any disappointment this news may cause you. You may check how many devices you have registered by logging into BestBuy.com. If you have any other questions, please let me know. I registered for Best buy mobile with my phone #, then upgraded 2 different lines on our mobile account and I still have not recieved the $25 reward certificates for doing so. Welcome to the forum and thank you for reaching out to us regarding your My Best Buy Mobile reward. If you haven't already, please take a moment to review my previous responses. It is likely that if you didn't receive your reward, your phone(s) weren't properly registered with the program. I apologize for any disappointment that this news may cause you. I would encourage you to log into BestBuy.com to check how many devices you have registered. If you need any further assistance, please feel welcome to reach out to me via private message. Hi, I recently saw a deal you advertised where if I signed up for Best Buy Mobile and bought/activated a phone, I would be eligible for a $25 gift certificate. I signed up for Best Buy Mobile and bought/activated a phone but have yet to receive the gift certificate. 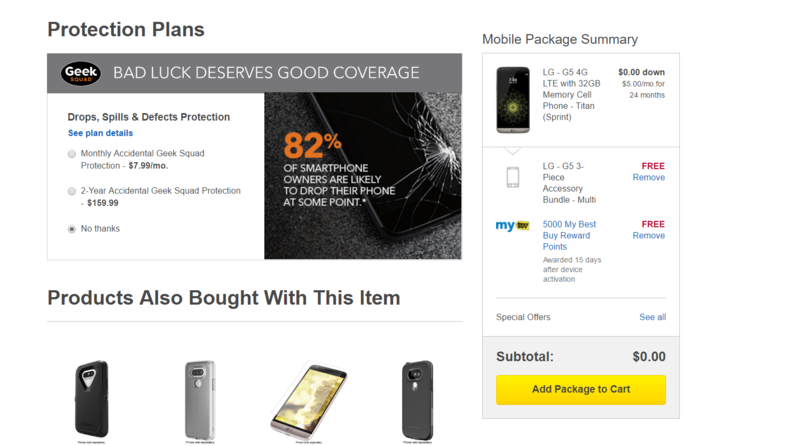 The phone is showing in my Best Buy Mobile account. Thank you for contacting us about your My Best Buy Mobile reward you believe you are owed! Please take a moment to read my previous responses to this thread if you haven't already. As you may see, this offer is only fulfilled upon your next phone purchase. For example, if phones A, B, and C are purchased and enrolled, then you purchase phone D a week later, you would receive 3 certificates for A, B, and C. Then, if you properly enrolled phone D from your 2nd purchase, and purchased phones E and F at a later time, you would receive 1 certificate for phone D, and so on. However, if you only properly enrolled phones A and B, when you purchase phone D, you would receive 2 certificates for phones A and B, but not C.
As it sounds like you've only purchased and enrolled one phone thus far, you would not receive a certificate quite yet. If you have any questions, please let me know. Hi, I recently brought 2 phones from BestBest.com on 3/2/17, these were both upgrades and both phone lines were previously enrolled in My Best Buy Mobile. It looks like I recieved one of the 1250 points for the Best Buy Mobile Reward. However for the second purchase the bonus points appear to be missing. These were 2 separate purchases on the same day. I tried to confirm that I recieved the bonus points for the Best Buy Mobile Reward but I can not see the points from this purchase in my rewards history at all. Even the bonus points from the first purchase that I belive posted I do not see in my rewards history. I am hoping that someone can look into this for me. Any help with this would be greatly appreciated. Welcome to the forum and thank you for reaching out to us regarding your My Best Buy Mobile rewards. Please take a moment to review our responses to this thread if you haven't already. It's wonderful to hear you had your phone lines previously registered. With that said, I'm sorry if your reward certificates haven't been issued as you anticipated for this program. If your certificates haven't posted, it is likely because they didn't qualify. You may review your registered devices by logging into BestBuy.com. With that said, if you're certain your purchases should have qualified, please feel welcome to reach out to me via private message. When will recieve my $25 certs, it has been well over 20 days. I bought about 8 phones recently from bestbuy.com. They all had in my order along with the phone the $25 certificate after 15 days! It has been 30 days now and I have yet to recieve them. I also don't see them "pending" there seems to be no sign of them. I've attached a pic to show you how all the orders showed the points. Please help!